Cork oak (Quercus suber L.) is one of the most typical and abundant tree species in Spain. Its ecological value is very high and their economic production is of great importance. 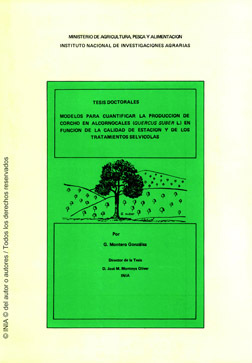 In the present thesis are studied: the ecological and silvicultural characteristics of cork oak stands, the main parameters that define the tree cork production ability and the more appropriate statistical models to evaluate the cork yield. INIA. Servicio de Publicaciones. Ctra Coruña km 7,5. 28040 MADRID. Contact: distri@inia.es. Tel: (34) 913471493.